This recipe is a lot of writing, but it really does go fast. The majority of the time in the kitchen, you are waiting for the mixture to cool, so you can be working on other things. I normally make my yogurt while doing meal prep or washing dishes, as it does not need a lot of attention to get it right. I recommend So Delicious’ coconut milk yogurt as the starter. Portion it out into an ice cube tray, about 1 Tbs per cube, and freeze the extra. That way, you always have starter on hand when you need it. You can use a previously brewed batch to start a new batch. This is called chain-yogurting. After 5-7 times of using a previous batch, the yogurt starts to not turn out so well and you will need to start again with fresh starter. Between freezing the remaining yogurt and chain-yogurting, I can often get 6 gallons of homemade yogurt out of one container. That brings the cost down considerably when coconut yogurt is $2+ a cup. The starter must have live cultures to be able to create homemade yogurt. Some people who tested this recipe felt that using all coconut flour make the yogurt imparted a slightly rough texture. I compensated for this by using some tapioca flour, but tapioca does have a flavor and it does have an apparent texture if not incubated long enough. Tapioca does make the yogurt thicker, lighter in color and imparts a finer texture to the finished yogurt when incubated long enough. You might wish to try the yogurt both ways to decide how you like it. Finally, the sweetener is necessary in the recipe as it feeds the beneficial bacteria. When I attempted to cut back on the amount, a sulfur smell would develop in the yogurt from the beneficial bacteria dying off due to a lack of food. This is especially important to keep in mind if you would like to incubate your yogurt for 24 hours to get the maximum probiotic content. Add a little extra sweetener if you’re concerned. Gelatin is available in packets at the grocery store under the Knox brand. I recommend you consider the Great Lakes or Bernard Jensen brands of gelatin, both recommended by the WAPF, if you wish to make this regularly, as they are low-heat processed to not contain free glutamic acid. They are also cheaper in the long-run. The Great Lakes gelatin costs 5 cents per teaspoon on Amazon.com right now (~$20 for 2 pounds) and is available in beef and pork origins. Knox costs double that. If you read the sidebars of Nourishing Traditions, you will see the gelatin has many beneficial qualities and can be used in a variety of dishes to encourage improved digestion. An accurate thermometer is critical if you’re going to get this recipe to turn out right. Please don’t blame a recipe failure on me if you do not use a thermometer and guess at the correct temperatures. To know if your thermometer is accurate, immerse it in boiling water. It should read 212 degrees Fahrenheit. First, you need to choose how you would like to incubate your yogurt. There are methods and information all over the internet, so I will share my preferred method, which is using a heating pad. After trying this method, this seemed like the most convenient and cheapest way to incubate it, as I do not have a gas oven with a pilot light. This method was featured in The Tightwad Gazette by Amy Dacyzyn and is not my original idea. The cooler and crock-pot methods didn’t produce consistent results for long-cultured yogurt since the temperature would fluctuate or run too high. A constant temperature is critical to get the yogurt to turn out thick. You first need to determine what temperature you need to set your heating pad on to keep the yogurt at 110 degrees. Place a couple of kitchen towels down on your counter, place the heating pad on top, then put another kitchen towel on top of the heating pad. Set a mason jar of warm water on top of that. 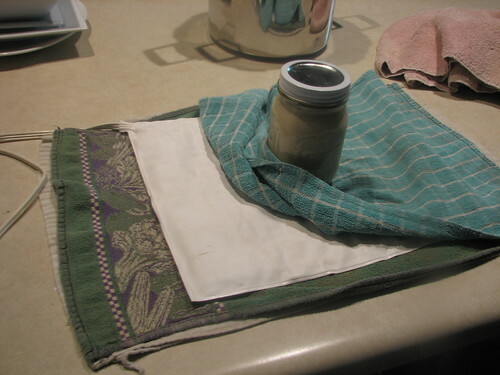 Wrap a towel or two around the mason jar, then invert a big stock pot over top of all of it. Set your heating pad to medium and the next morning, check the temperature of the water with a thermometer. Adjust the temperature of the heating pad up or down until the temperature of the water consistently reads 110 degrees. 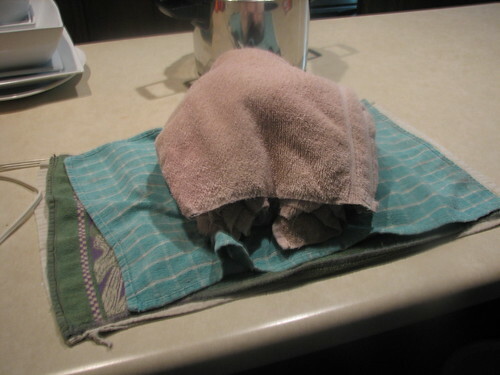 Put down a couple of kitchen towels, put the heating pad on top, then cover it with one towel. 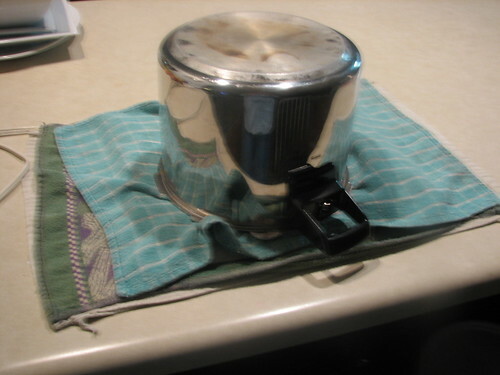 Cover the jar with a thick towel, or several kitchen towels. The pink towel is an old bath towel I now use just for making yogurt. Cover it all with a stock pot. You can make as much or as little yogurt as you want at one time, limited only by your heating pad capacity and the size of your biggest stock pot with which to cover it. My largest stock-pot can accommodate four quart jars without a problem. Everything you are using must be extremely clean. Run all equipment, except the thermometer, through a hot dishwasher cycle with no other dishes to make sure it is very clean, or you can pour boiling water over or immerse the items (except the thermometer) into boiling water. Any bacteria left on the equipment will compete with the beneficial bacteria in the yogurt. It’s best not to give it an opportunity to flourish. In a stock-pot, whisk together the milk, rapadura, coconut flour and tapioca flour. You need this mixture to be smooth, so if you did not sift your coconut flour, you will need to use an immersion blender, pour it into a blender or whisk like crazy to get it smooth. Clumps of flour in this mixture mean lumpy, uneven yogurt. Sprinkle the gelatin over the top of the mixture and allow to sit for three minutes to soften. Whisk the gelatin in thoroughly then put over medium heat. Bring to a boil, whisking regularly. Remove from heat. If you see any lumps, use a blender or immersion blender. Clip the thermometer onto the side of the pan and suspend it in the milk so that it is not touching the side of the bottom of the pan, and is in the middle of the mixture. Allow the milk to cool to 110 degrees. When the milk has cooled to 110 degrees, place the 1 Tbs starter into a small bowl. Dip out a small amount of the milk, pour into the bowl with the starter and whisk until smooth. Pour the starter mixture into the milk and whisk. Whisk it in thoroughly, then pour your milk into your clean mason jars. Place the jars back into the incubator set-up as described above. Allow it to sit, undisturbed, for 8-24 hours. The longer you let your yogurt ‘brew,’ the tangier it will be. The longer you brew it, the more probiotics it will have. The trade off is that the more probiotics it has, the tangier it will taste. I recommend you very carefuly unscrew the lid and try a little at 12 hours and judge from there whether you want it to go longer. Check periodically to make sure a sulfur smell is not developing if you would like to do a long-brewed yogurt for maximum probiotic content. Carefully transfer it to your refrigerator and chill. Try not to jostle it, and definitely don’t stir it. The yogurt will be thin until it is cold. 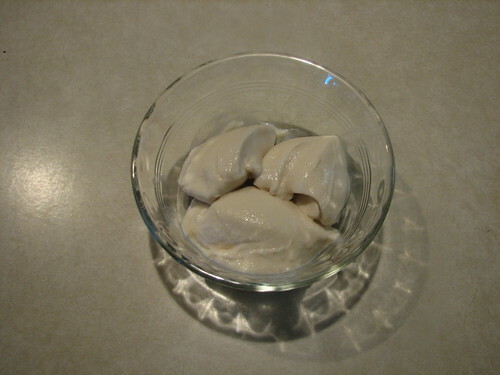 Once it is chilled, the yogurt will be thick. I know this post is older & it’s about kefir not yogurt, but I’m trying to plan my food budget & assumed that coconut milk yogurt would be much cheaper to make than raw milk yogurt, because raw milk is $18 a gallon here (& I’ve yet to hear of someone paying more than that), so that’d be $4.50 for a quart. But the BPA free cans of organic coconut milk, from a co-op, are $2 a can, which is only 13.5 ounces. So I would need two & a half cans to make a quart, which makes it $5. So either my math is very bad or it’s actually cheaper for me to use raw milk instead of coconut milk. Help?!? It would be $4 for a quart of cocoyo. You only want to use 1-3/4 cups, or one can, per pint, as the starter and flours make up the other 1/4 cup to get to one pint. So, do you use canned coconut milk to make the yogurt, if so what brand? Also can you use the So Delicious carton of Coconut Milk? Or can you thin canned coconut milk out a bit with some water or is this not recommended? I use Native Forest because it is BPA-free and it is cheaper than any other option I have. Clients have reported using So Delicious with success, it’s just a little thinner. You probably could thin out the canned coconut milk yogurt, in fact that’s a good idea that I should try to see how it goes. so regular yogurt will not work as a starter? Yes, it will. I recommend the coconut milk yogurts as a starter just because most people who are using this recipe do so due to dairy allergies. But they all have the beneficial bacteria in them that will make yogurt, so it’s fine to use. Hi! I was so excited to get this recipe. But I tried it twice to the letter and all I get is a cream colored liquid on the bottom and an amber colored liquid on top. It separates out and never thickens. Have any tips? Have you experienced this? Lindsay, I get separation like that when the temperature isn’t right. I’d say check the thermometer you’re using. You’re trying to get 110 degrees. Why do you use the flour? Can I use it without it? The flour is to thicken it. You can do it without the flour, but it will be considerably thinner. I forgot to mention, I love your heating pad and pot on top method. Never thought of doing that before. Can you do this with almond milk also? My kids don’t like the coconut milk and coconut milk yogurt as much, but they love the almond milk products. Could I use the same recipe, or should I make changes? I am VERY excited about this! I’ve been wanting to make homemade coconut milk yogurt. I’m quite excited about it. Thank you so much. Very great post. I just stumbled upon your weblog and wanted to say that I have truly loved surfing around your blog posts. In any case I will be subscribing on your feed and I hope you write again very soon! Thanks so much for posting a recipe that doesn’t require the use of a separate culture as a starter–I like being able to use a little bit of yogurt instead. This recipe came out great! I minimized the need for vigorous whisking by mixing the flour with a small amount of the milk before adding it to the larger batch–like you would before adding flour to a soup or sauce. I used homemade coconut milk, so I had a creamy top and liquidy bottom when it came out of the yogurt maker, but a little stir mid-way through the setting time in the refrigerator made everything blend together and stay that way. Thanks again for the recipe!! I found your recipe yesterday and could not wait to get home to try it… and taste it. I doubled the recipe to fill all my jars in my yogurt maker; I used honey and agar agar (what I had on hands). I put everything in my Vitamix (except the yogurt starter) and the result was a sweet and frosty coconut milk that was super easy to work with (no lumps). After heating, I added the starter and used the blender again to make sure that they were not any lumps. I filled my little glass jars (it looked beautiful) and waited feverishily. My husband asked what I was doing sitting and looking at my yogourt maker. When I told him, he mumbled something about dirtying dishes for nothing again (he had a point – I have tried to make dairy free yogurt many times before and the results have not been so good). This morning, I tasted my yogurt and could not believe it – it was delicious, creamy, sweet and tangy. I would dare to say, it was the best yogurt I have tasted in years. Now, I am not the most critical person in my house when it comes to my dairy-free yogurt…So to get a second opinion, I gave some to my husband, who, to my greatest surprise, accepted to give it a try. He loved it and said that he would like me to make it again! On a roll, I decided to try giving some to babygirl, but wanted to add a little flavour first. I emptied a jar in the Vitamix and added a handful of frozen strawberries. I offered the nice pink mixture to my babygirl and waited for that scrunched up face… but she offered a big smile and gestured toward to bowl for more. So, in brief, this is a wonderful recipe and I will make it again and again. It is a great way to get good probiotics in our dairy free diet. I have read some critics about it being made with canned coconut milk – not raw milk or fresh coconut milk. I side with Kerry Anne here – some of us are busy with limited budget and we do our very best to put healthy nourishing food on the table for our families. Sometime, compromises have to be made. One more thing, I live in Canada – coconuts here are expensives and can be hard to find (depending on where you live and the time of year). Until we figure out the way to grow coconuts cheaply in our cold climate, I am happy I found a recipe that let me enjoy my yogurt after many years. Yay!! I’m SO glad you enjoyed it! Whoo hoo! I really want to try this! My daughter eats coconut yogurt from the grocery, but I would rather make it. 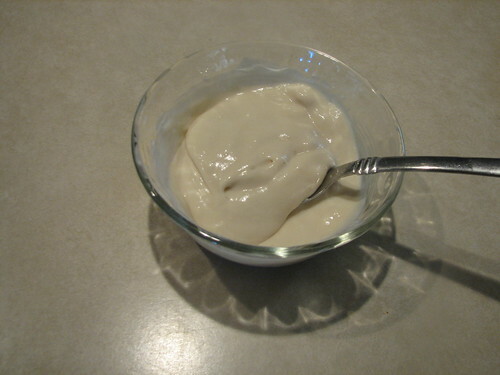 I have made regular yogurt and it turned out great! However, my problem with making yogurt is that the only flavor my kids will eat is vanilla and the alcohol in the extract will kill the good bacteria. I have posted about this on several blogs, but have never gotten an answer. I have seen alcohol free vanilla extract before, but I can’t find it again. What about vanilla powder or vanilla bean paste? Divine Organics makes one as does Massey- I think that’s the brand. Authientic foods makes a vanilla powder. I’d say give that a whirl. You can also stir in the extract when you serve the yogurt if those aren’t in the budget. I can use those only if they are safe for my peanut and tree nut allergic daughter. I’ve never seen those before, but will check them out. Thanks. You could also heat the milk a bit to cook off the alcohol. I do that when making dairy yogurt for my boys and it must work because it turns into yogurt. Hannah, it’s liquid until it is refrigerated. If you just turn out with a thick liquid after being completely chilled, it is a sign that the culture you used didn’t have any living probiotics or they were killed by something like too high of a heat. Hi! I’m new to yogurt making, i keep getting an egg/sulfer smell and seperating with my yogurt. I use the oven method and bio-k probitoics. Separation with a sulfur smell happens when I incubate at too high of a temperature. Have you used a thermometer to check the temp your yogurt is staying at in the oven? I’d put a jar of water in and check the temp after several hours to see what is happening. I haven’t but I will tonight! Thank you!!! I am so glad I saw this article about coconut yogurt!! I love making yogurt and using healthier milks is my goal. I make my usual yogurt in the crockpot with great success. I am going to do the coconut method your way. Certainly do not want to experiment with that!! The one question I have. I freeze some of my yogurts to store and to use sometimes in the ice cream freezer. Can this coconut yogurt be frozen and will it be ok to use in the ice cream maker? Linda, I have frozen it and made ice cream out of it with great success. I hope you enjoy it! I was wondering whether you could tell me if Coconut Flour has any of the benefits of Coconut Oil? I read an article recently: http://blog.wellwisdom.com/natural-relief-autoimmune-disorders/ that said it might be of some help to me. Also, any suggestions how to make your recipe a bit healthier with some substitutes? Thanks! :) Great Article!